Ella Hickey was the recipient of a $1,000 scholarship from the Meghan M. Johnson Memorial Scholarship Fund. 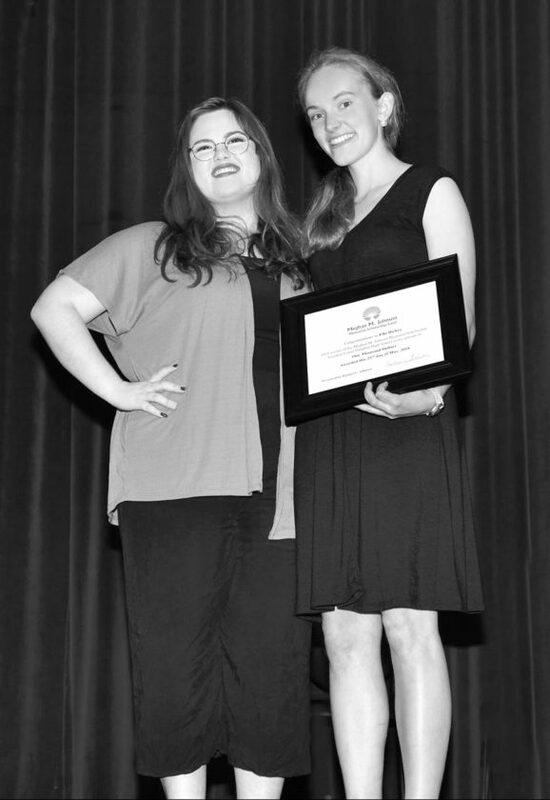 Hickey was presented her award by Rachael Johnson (Meghan’s sister) at the Lower Dauphin High School Senior Social and Awards presentation on May 23. The Meghan M. Johnson Memorial Scholarship Fund will also offer scholarships to Mifflin County High School seniors pursuing a higher education in the arts, starting in the spring of 2019. Meghan and Rachael Johnson are the granddaughters of Marlin and Judy Johnson, of Lewistown. Meghan sang at the McVeytown Memorial Day parade in 2014 and 2015 and at Spring Run Church of The Brethren in August 2016. Meghan also performed at her grandparents’ 50th wedding anniversary in Lewistown, and participated in Relay for Life at Kish Park when she was younger. While attending Lower Dauphin High School, Meghan starred in many of the high school musicals and plays in addition to performing in numerous local theater productions. Meghan was a professionally trained vocalist since the age of 8. A 2017 graduate of Lower Dauphin High School in Hummelstown, Meghan passed away on Nov. 21, 2017, after a long and courageous battle with Stage 4 Glioblastoma brain cancer. Meghan was just five days shy of her 19th birthday. The Meghan M. Johnson Memorial Scholarship Fund was created to continue her legacy, by presenting scholarships to students pursuing a higher education in the ats. Additionally, the fund seeks to promote brain cancer awareness and glioblastoma research.